If you need a broadband light source in the UV/Vis/NIR portion of the spectrum, an arc lamp has no peer. 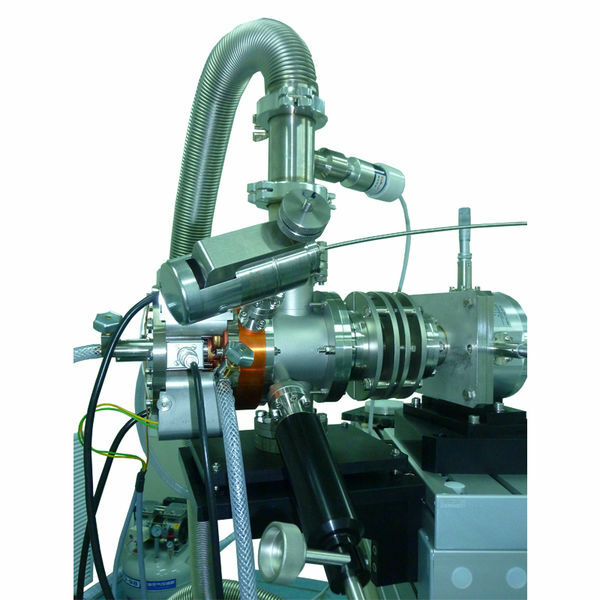 And if you are looking for the most intense broadband light source you can get, then the KiloArc™ has no peer. The intensity of an arc lamp is extremely high and, depending on the lamp, reasonably continuous throughout the region from 240 to 1,200 nanometers. 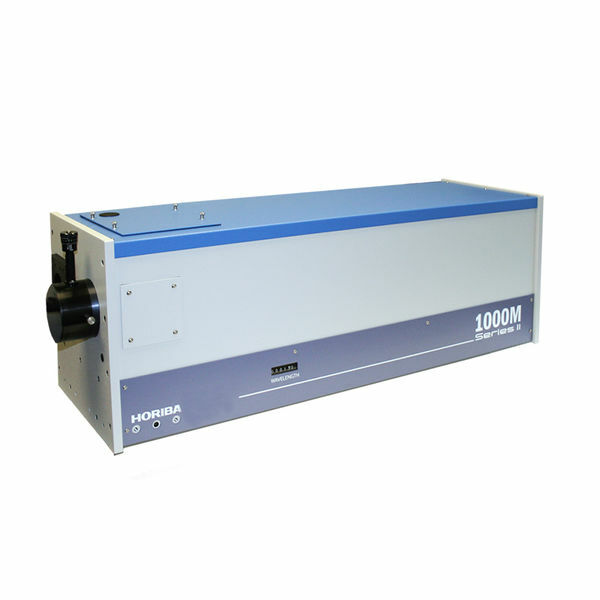 Usable intensities are even available in the deep UV down to 180 nm and in the near infrared out to 2,500 nm. 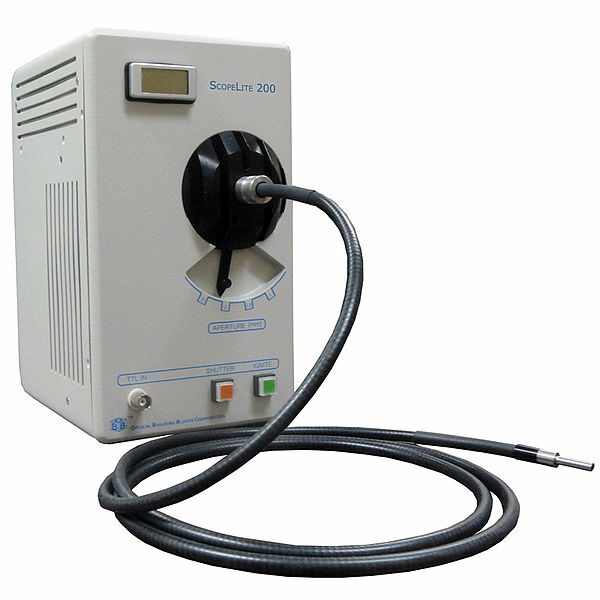 While arc lamps themselves are very similar from manufacturer to manufacturer, the arc lamp housings and power supplies that operate these lamps are very different from manufacturer to manufacturer. As such the arc lamp housing can have a dramatic affect on how an arc lamp illuminator performs. We believe that our long experience in light source design is what allows us to give you a unique light source that truly is a better illuminator. 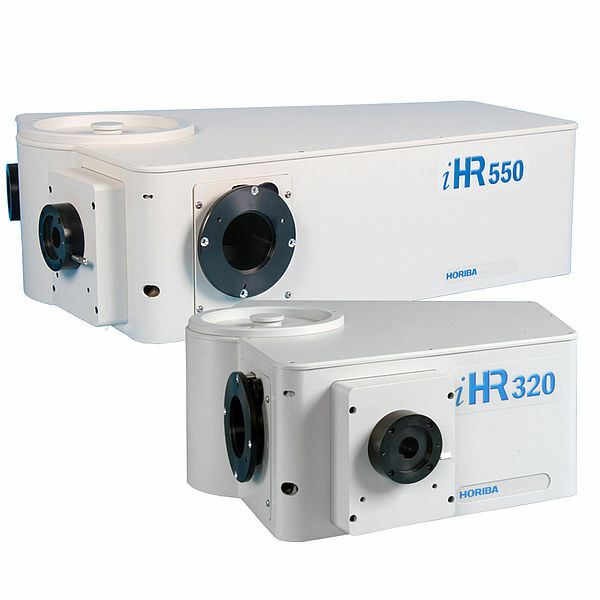 Delivers over 100 watts of optical power to an 8 mm spot. 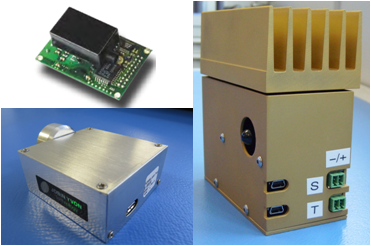 Compact Integrated design includes everything, housing, power supply, igniter. No tools required to change lamps. Delivers the brilliance of 1,000 suns. Ozone free operation, venting is not a necessity, but an option. Economical, the most watts for your dollar. You would have to buy 6 old style vertical arclamp housings to deliver the same number of photons that a KiloArc™ arc lamp illuminator delivers to a focused spot! Users of old style vertical arc lamp housings are throwing away as much as 90% of the lamps output, due to poor collection efficiency. These old style vertical lamp housings have a collection lens in front of the arc lamp and sometimes, but not always, a back reflector behind them. The problem with this old design is that only the light that actually strikes these optical elements is delivered outside of the lamp housing. All other photons emitted by the lamp are wasted, simply heating the inside of the lamp housing. Conversely the unique KiloArc™ lamp housing has an enveloping ellipsoidal reflector that collects virtually all of the light emitted by the lamp arc, delivering those photons to a secondary focal point outside of the lamp housing, and it does so without any lenses. For an equivalent wattage of bulb, the KiloArc™ delivers 5 to 6 times more light emitted by the same bulb, to the secondary focus which is outside the lamp housing! Our design just simply collects a larger solid angle of light than does the old style. That means that an OBB KiloArc™ lamp housing with a 1,000 watt xenon lamp provides the equivalent optical power of a 6,000 watt xenon lamp in an old style vertical lamp housing. And it does so with much greater power density due to a smaller focal spot, and at a small fraction of the cost. At the heart of every KiloArc™ is a proprietary on-axis ellipsoidal reflector. Our reflectors collect up to 70% of the radiant energy from the arc lamp, versus only 12% for typical condenser systems in vertical lamp housings. The ellipse literally wraps around the arc lamp, collecting 5 to 6 times more output power than from a conventional system. The arc source is located at one focus points of the ellipse, and the radiation is reflected by the ellipse to the secondary focus which is actually outside of the KiloArc™. Since the light is brought to a focus by reflection rather than refraction (through a lens), there are less losses from absorption or lens-surface back-reflection. This design is so efficient that a Lamp housing can deliver up to 11 times more optical power into a given smaller area than a conventional lamp housing. The KiloArc™ is a sealed arc lamp housing with a quartz window through which the focused light is delivered. Below is the spectral transmission curve for the quartz window. Unique Quick Release Self Aligning Arc Lamp Replacement. You have a choice of two lamps depending on the spectral output that you require; xenon or mercury-xenon. The lamps are provided as a complete pre-aligned assembly which includes a cooling fin and a quick release self aligning connector. Of course you may order both types of lamps as they are interchangeable. 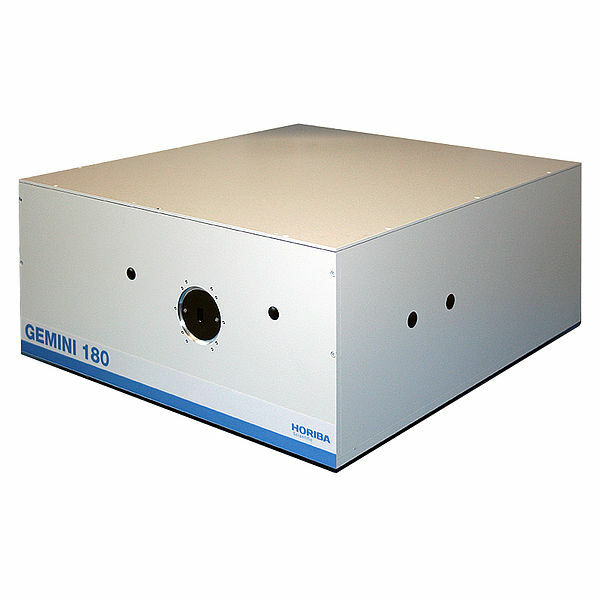 The xenon gas used in the lamp provides continuous spectra from 180 nm to 2,500 nm at varying intensities. The mercury-xenon provides more of a line spectra.http://www.obbcorp.com/optical-components/light-sources/Popups/Mercury-Xenon.html The spectral curves for xenon and mercury-xenon are normalized (relative intensities) therefore, although you cannot tell from the curves, the mercury-xenon lamp actually has greater intensities than the xenon lamp at it’s various peaks. 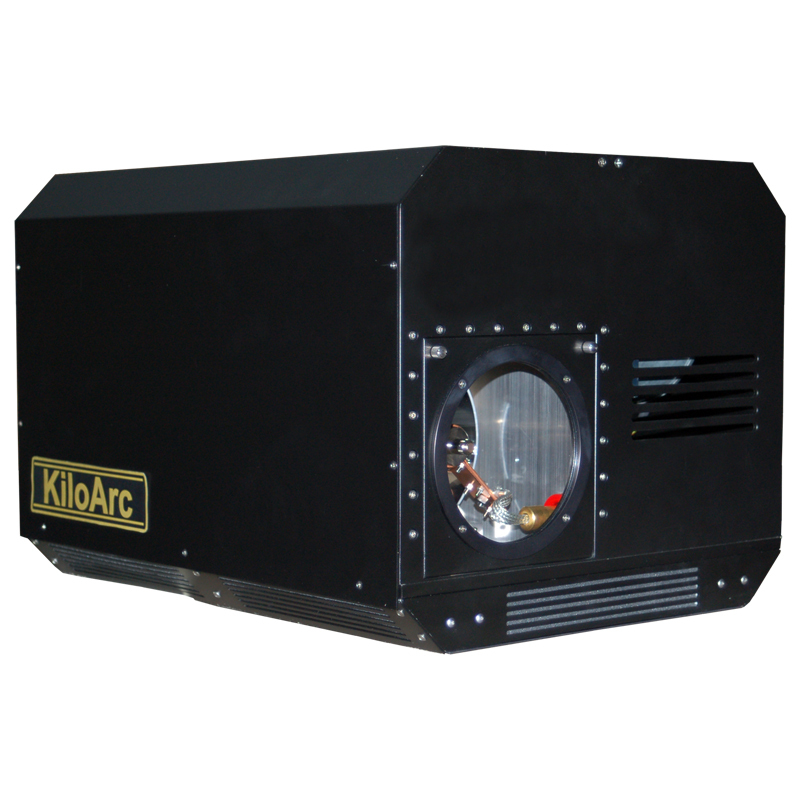 The KiloArc™ uses ozone free quartz lamps which cut off the deep UV below 240 nm. Typical lamp lifetime is 1,500 hrs. The lamp lifetime is highly dependent on operating conditions. Lamps should not be operated above their rated wattage (1,000 W). 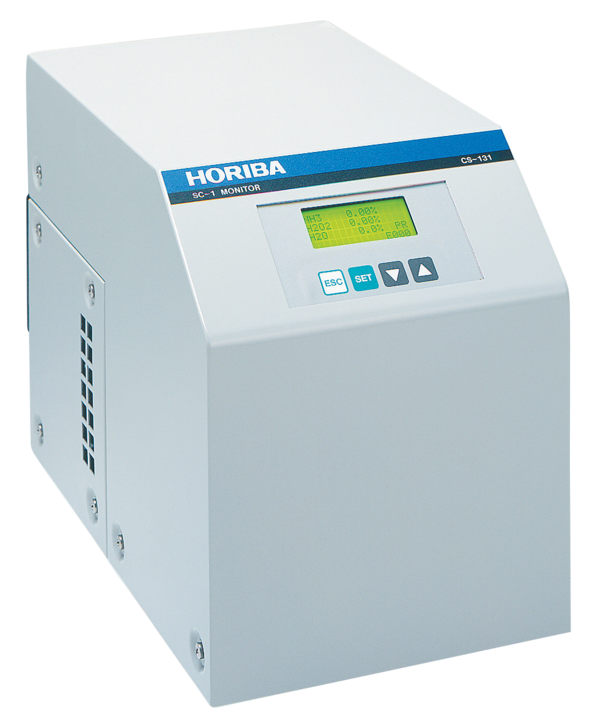 As an option available at the time of purchase, the KiloArc™ illuminator may be operated remotely with two different control choices. There is a BNC control accessory and a USB control accessory. 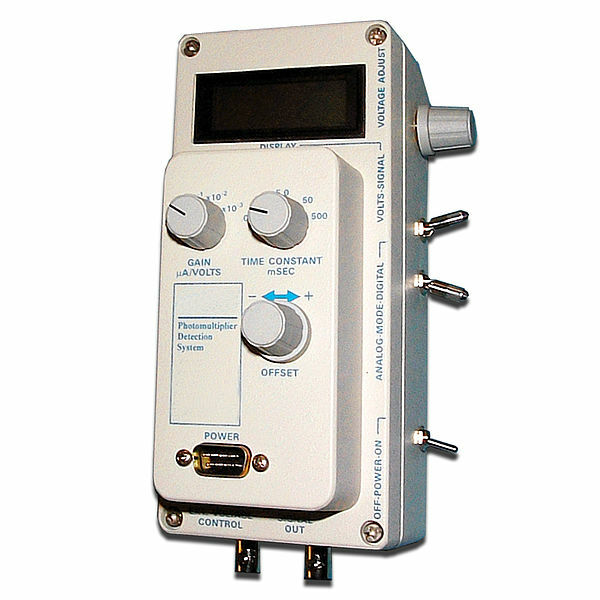 BNC Remote Control: The BNC remote control enhancement of KiloArc™ allows for manual control or remote voltage control. 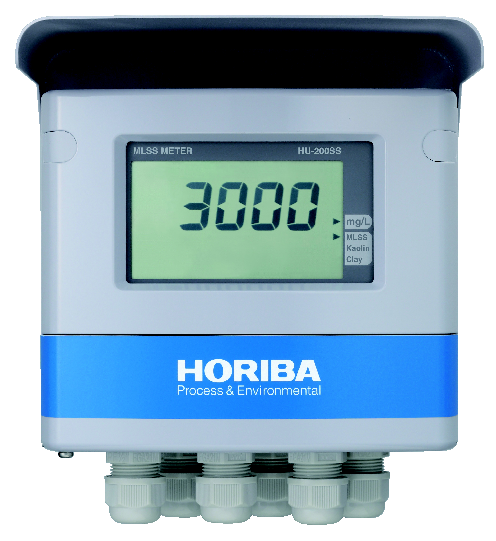 This option adds a BNC control and BNC indicators to the standard manual controls. 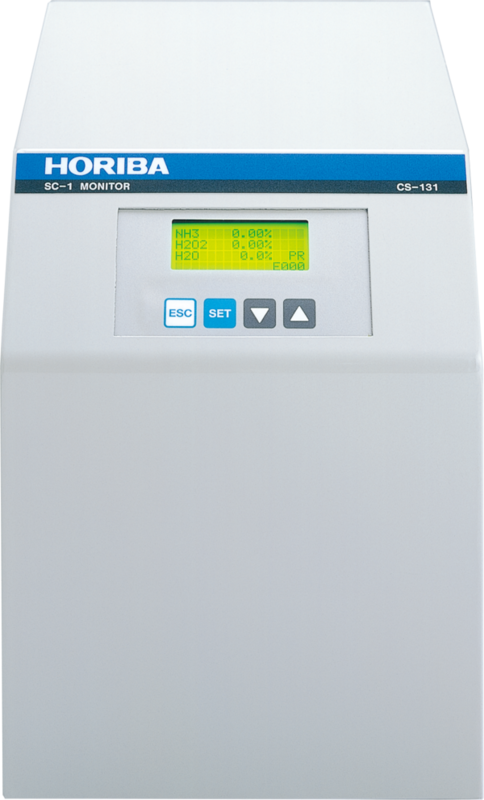 It includes a manual/remote control switch, 0-5 volts remote control BNC, light on BNC TTL status indicator and error BNC TTL status indicator. With this option the KiloArc can be controlled with the standard manual controls, or switched to remote BNC voltage control. USB Remote Control: The USB remote control enhancement replaces the standard manual controls with a remote USB control. This option replaces the manual controls with a USB control of on/off and voltage power adjust. 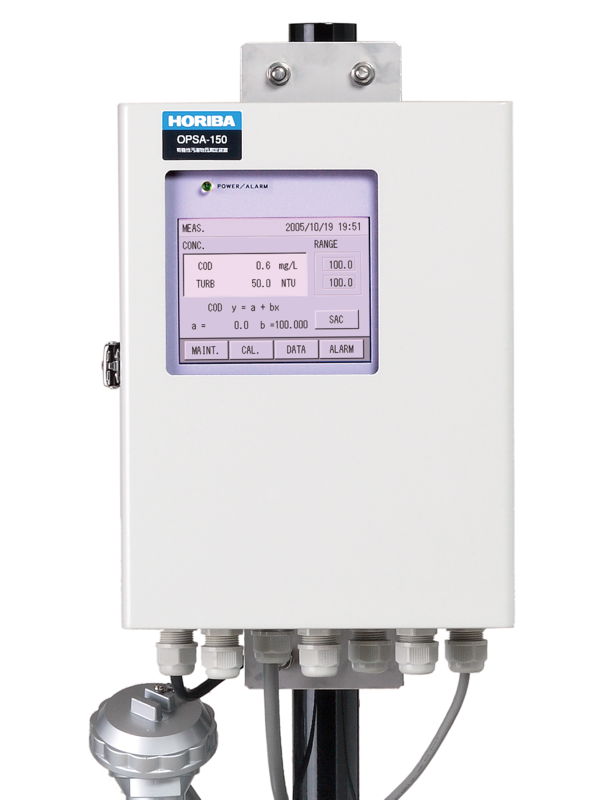 It includes a Universal Library and a LabVIEW driver. Manual control of KiloArc™ is not possible with this option. The KiloArc™ does not generate harmful levels of ozone (less than a typical copier) with the standard lamps. However for the optional UV enhanced lamps the KiloArc does generate ozone For this reason there is 4" hose adapter on the top of the unit to vent heat and or ozone. 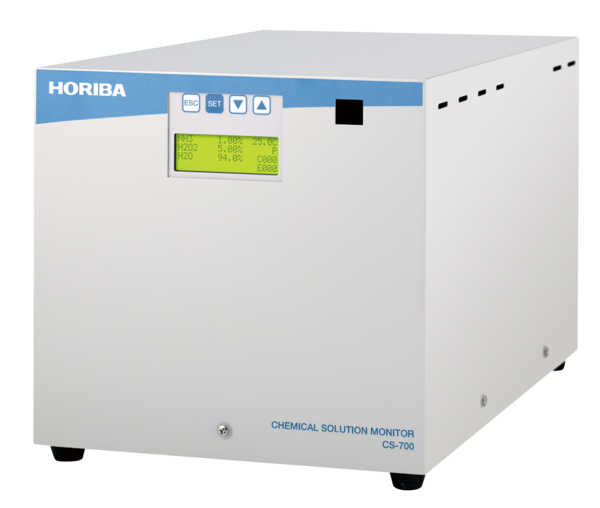 Consult with your lab safety officer for proper and safe venting of ozone. 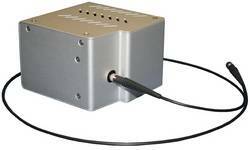 The KiloArc™ arc lamp illuminator delivers 100 watts of broadband optical power to an 8mm spot! To determine how much light the KiloArc™ delivers in a specific wavelength region for a given lamp refer to the following spectral output curves for the xenon and mercury-xenon arc lamps. These curves provide an estimation of the percentage of the total optical output power for a given wavelength range of the emitted light from the lamp. How much light does the KiloArc™ arc lamp illuminator deliver with a 1,000 watt xenon arc lamp in a 5 nm bandwidth at 400 nm? The answer is an astounding 500 mW! Here is how we get that answer as well as a cautionary note about this number. Calculation: The total power of the 1,000 watt xenon lamp is 100 watts broadband (100,000 mW). Referring to the Band Pass Intensity Chart, and graph, for the xenon lamp indicates that at 400 nm there is approximately 5% of the total lamp output in a 50nm wide band. Therefore in a 5 nm bandwidth at 400 nm there will be approximately 0.5% (1/10th of 50 nm) of the total lamp output. This corresponds to 500 mW. Caution about available energy: Remember that not all of this light may be available to you for your application. In the first place the KiloArc™ is so powerful that we would recommend using an IR heat filter to prevent damage to secondary optical elements. Although this primarily cuts out the IR there will be some loss at other wavelengths through the water jacketed, water filled, IR filter. Filter for wavelength selection: If you wanted to use a 5 nm bandpass filter for wavelength selection, then there will also be losses through the filter combinations you would use to filter out the unwanted wavelengths without photo-damaging your filters, as well as coupling losses for any optics you incorporate. Therefore you will end up with less than 500 mW, but you will still have a severely intense beam of light. 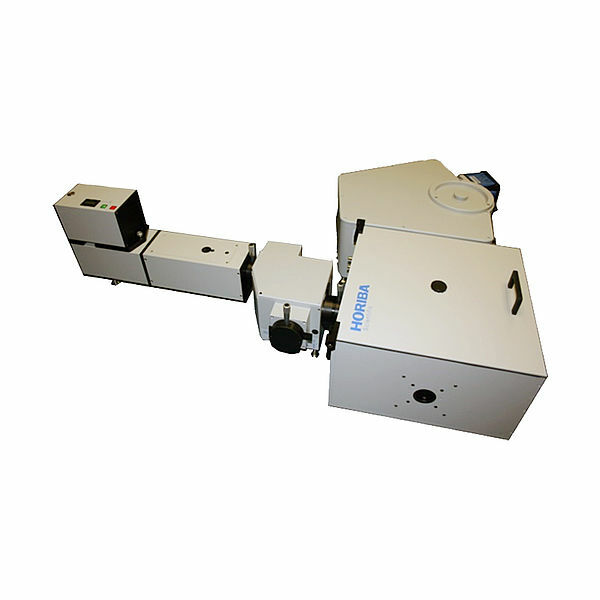 Monochromator for wavelength selection: If you are going to use a monochromator to filter and select the 5 nm output at 400 nm, then there are a number of factors to consider before determining exactly how much light will be available through the monochromator. 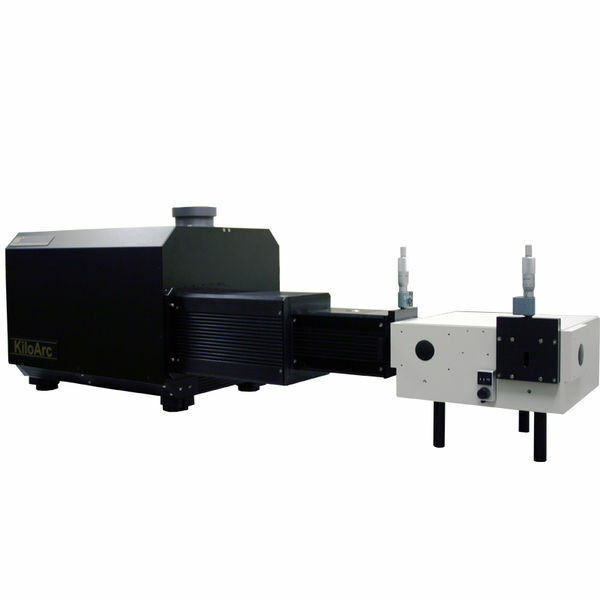 Specifically the slit size required for a 5 nm bandpass, the grating efficiency curve for the grating used, the f/# matching of the monochromator, and the throughput loss of the monochromator coupling. 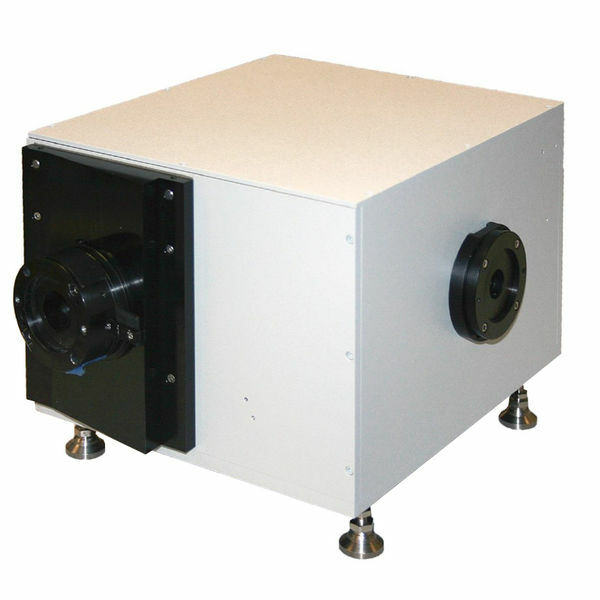 We provide a tunable KiloArc™ illuminator that consists of the KiloArc™ lamp housing coupled to a 200 mm focal length monochromator. When using the 1,000 watt xenon lamp a considerable amount of light in the original 8 mm focused spot doesn't even get through the narrow 1.25 mm slits required to obtain a 5 nm bandpass with a standard 1,200 l/mm grating. Firstly we have to remember that the 8 mm spot is actually the FWHM of the total light focused. This means that approximately half of the total power is outside an 8 mm diameter. So, less than 5% of the total focused light gets into the monochromators narrow 1.25 mm slit in the first place. 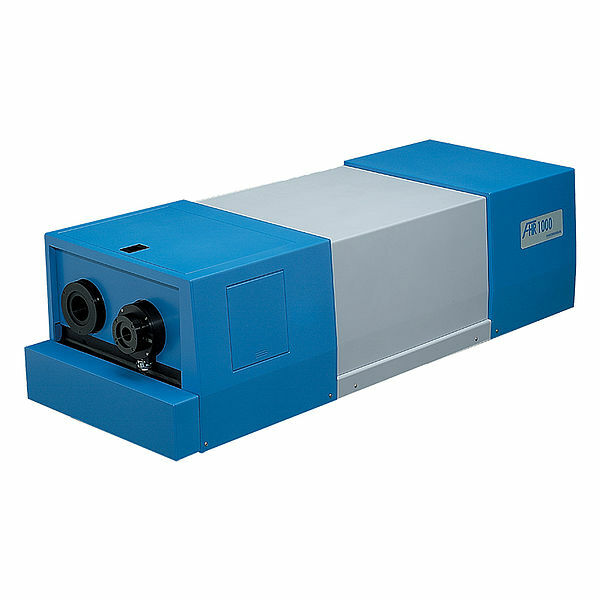 Additionally, depending on the grating used, its wavelength angle, its efficiency curve as well as the coupling loses of the monochromator you will have a total throughput for the monochromator of roughly 30%. This results in about 10 mw of energy delivered through the monochromator at 400 nm in a 5 nm bandpass. This number is in good agreement with our empirical results for the Tunable KiloArc™. Refer to the Tunable KiloArc™ web page for the corresponding output curve. Also remember that other monochromators, and certainly different gratings will have affects that will have an impact of the total throughput. 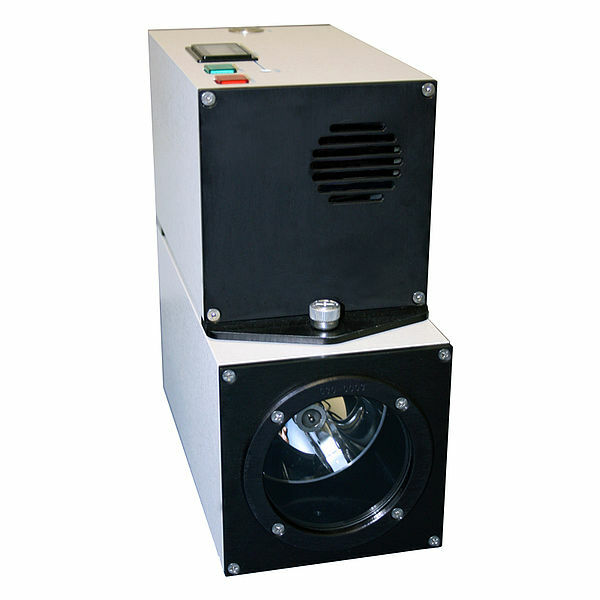 Applications for 1,000 watt arc lamp housings cover a broad range of scientific, OEM and research applications. 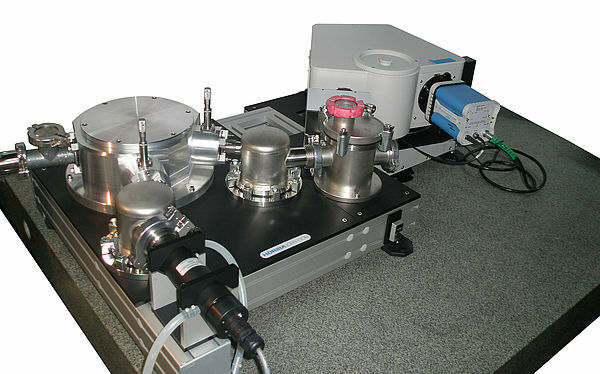 Arc lamp systems are the light sources of choice for a variety of spectroscopy systems. Arc lamp systems are also used for a broad a range of applications almost as diverse as the wavelength range across which they emit. 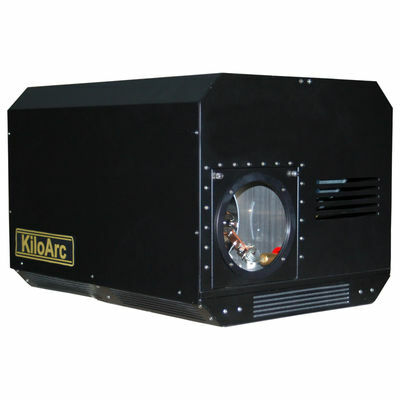 The KiloArc™ illuminator is one of many inter-connectable optical components. These Optical Building Blocks can be ordered together to form a complete subassembly or they can be subsequently added to one another. 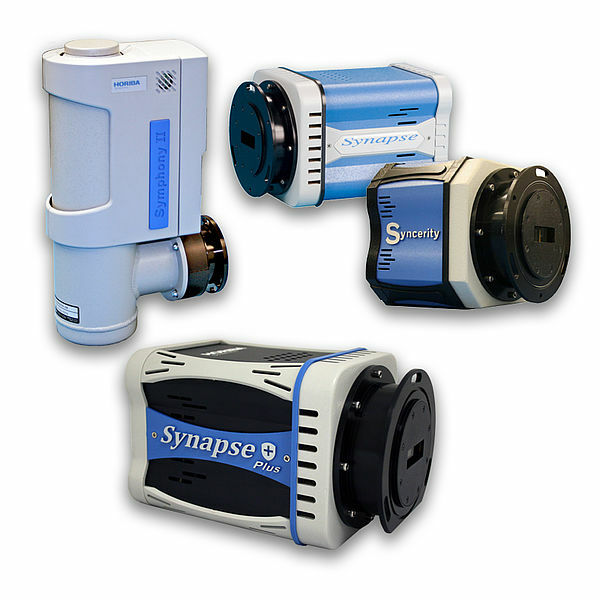 In fact there are enough components to choose from to build your own complete optical system for various spectroscopy requirements. 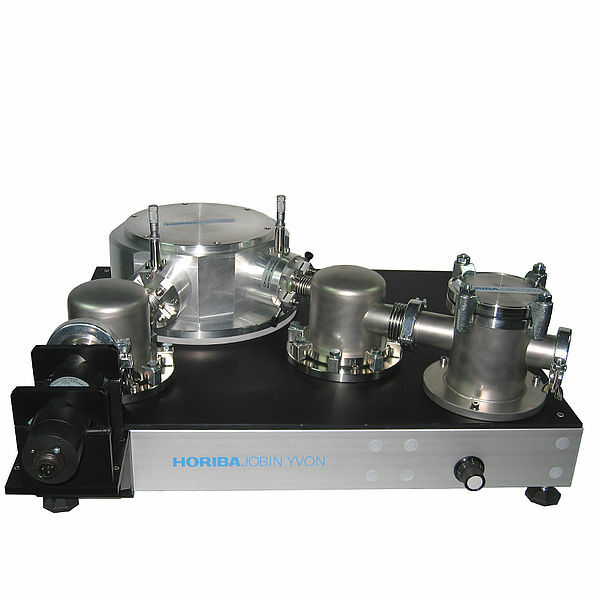 OBB has an excellent 200 mm focal length monochromator. 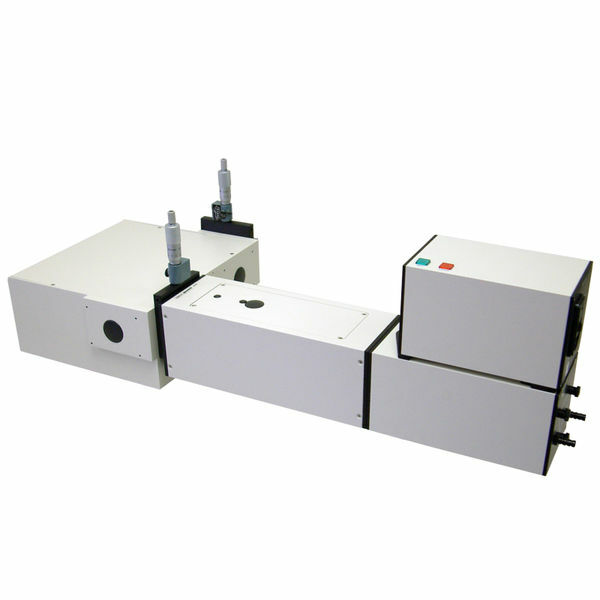 If you would like to couple the KiloArc™ illuminator to our monochromator, then we have a light shield adapter tube to physically connect them and create a tunable illuminator. Inside the light shield is held an IR filter to remove the heat component of the beam. 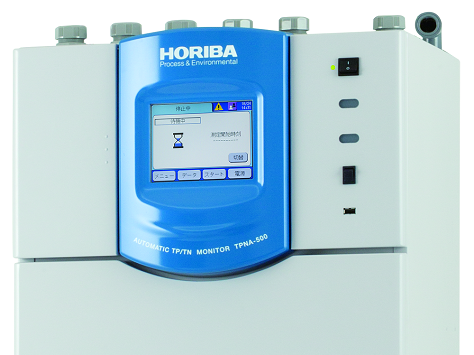 To learn more about our monochromators, click here. Incidentally, if you are looking for such a tunable KiloArc™ illuminator we have a separate page describing them here. 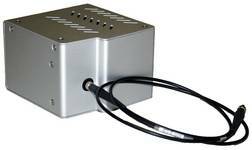 If you would like to couple your KiloArc™ lamp housing into a sample compartment, then we have an ideal solution. 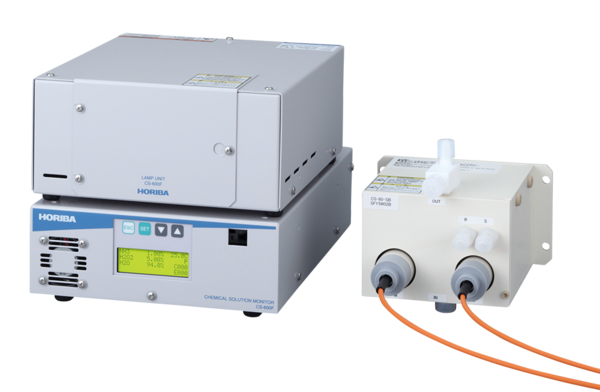 The QuadraCentric sample compartment is an excellent unit that has various sample handling capabilities. There is also a light shield adapter tube that directly couples the KiloArc™ lamp housing to the sample compartment with matching optics to focus light into the sample. Inside the light shield is held an IR filter to remove the heat component of the beam. 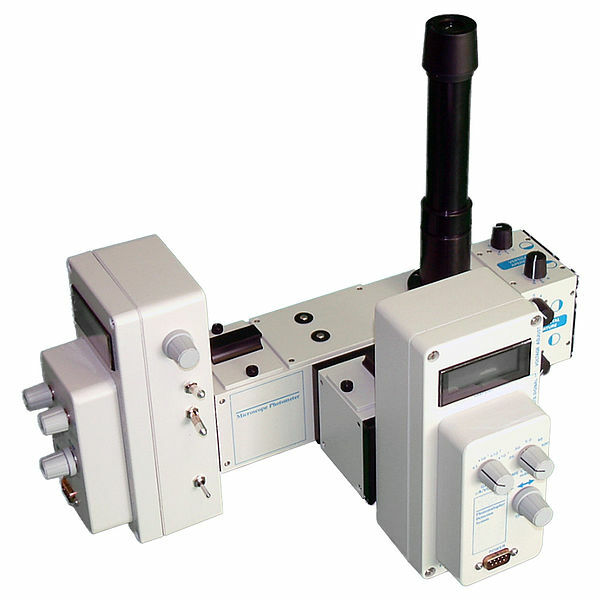 You can then have up to three other input or output optical channels to or from the central sample holder. 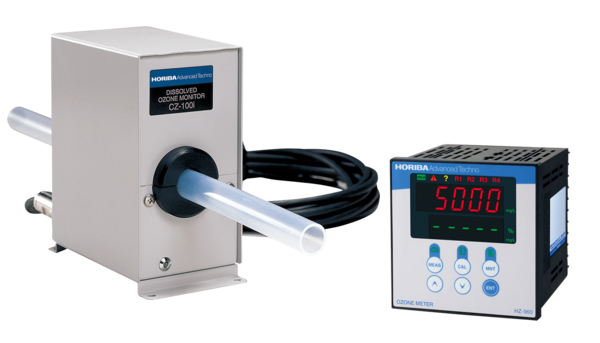 So you could create a right angle fluorometer or scatter system or a straight through absorbance spectrometer with the appropriate detection components. For each optical channel in the sample compartment there is also a filter holder for wavelength selection. To learn more click here. If you need a collimated optical beam, then a collimating lens can be employed for the diverging beam after the light focal point. Be sure to match the collimating lens for your beam diameter requirements and for the f/# of the light source you are considering. We offer a number of collimating lenses to choose from. Also if you need a uniform collimated beam of light be sure to consider an optical diffuser. There are many other accessories and options to choose from for the KiloArc™ lamp housing. Send us a web quote request with your requirements and we will be sure to get back to you right away.